This morning I gained intimate, carnal knowledge of a rare and majestic beast. Its name... DELOREAN. Here's the raw, uncensored up-close documentation of my experience. 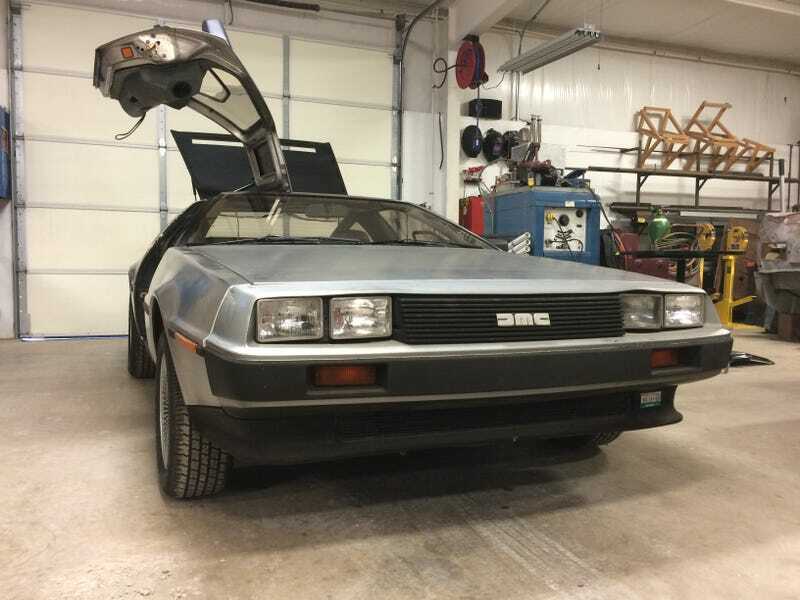 About a week ago my boss told me a Delorean was coming to the shop. I was thrilled. Probably a little too excited. The opportunity to spend some quality time crawling all over such a unique specimen got me all excited. This morning we finally started work on it. It seems this low-mileage sweetheart is in for some fresh paint on the bumpers. I've always liked the shape of these things and the crazy story of how they became more than just a dream. They're strange little cars with aesthetics that polarize onlookers. Some folks think they're great while others think they're ghastly. I fall into the former category and I just wanted to share some initial impressions of the car within an article that doesn't make reference to time travel movies or cocaine. This is a car with an identity, and it knows it. If the gull wings, and the stainless steel body work wasn't enough to let people know this car was something special, there are endless little reminders they're in a Delorean. When you leave the door open on a Delorean you don't just get any old dash light. Even the dash light lets you knows it's a Delorean. The instructions are illustrated in Delorean. The Delorean, like many cars, is a hodge-podge of parts from everywhere. French engine, English light lenses, a German cigarette lighter. The tail lights have a circuit on the back. This is not unheard of, but it is a little different than most cars. Something I have never seen before is the 1-800 number printed on the circuit board. Unfortunately though, 1-800-DMC-HELP is no longer a working number. The battery lives in a little box behind the passenger seat. Incidentally this bulkhead appears to be made of plywood. But you still jump the car from a remote terminal under the hood. The hood is pretty flimsy. It's covered by the black, louvered body work. There's a horn on a stick. Why isn't it in the middle of the steering wheel? Because Delorean. Instead of an engine up front there's a very shallow trunk. Beneath this is the spare and beneath that is the front mounted radiator. This car is definitely not the worst thing I've ever worked on. Overall I'd say the quality is good for the time. However, in some ways the technology of the times failed the poor DMC-12. The 30-year-old plastics are all warped and distorted. The front bumper cover on this one is inexplicably drawn up over one light, giving this car a sort of quizzical, lifted-eyebrow expression. Inside the seats are cushy and there are some massive rocker switches on the center console for windows and defrosters. The quality in here, although dated, is rather nice. The console upholstery is finished with tidy french seams. It would have been cheaper to go with a molded plastic unit, but this sort of classes it up. These cars are not without their faults. They aren't famous for performance from their wheezy Renault V6. I could see owning one of these if the price was right. You can't help but notice them. Whether or not you like the looks is another matter. However, 30 odd years later I think that the design is still stunning. 2 years ago Aaron Vick Starnes quit his well-paying bank job to pursue inevitable poverty as an automotive writer. He has experience in automotive restoration, and works at a shop restoring and customizing cars. He also is a grad student in journalism. Follow him on Twitter @AaronVStarnes and check out his blog.